If you’re trying to expand your creativity for using the Cricut Maker, there are many projects that you can take on with endless possibilities. There are many unique things about this machine that will make you want to use it more and more. Although there’s a wide variety of projects, using your imagination for DIY projects will prove that you have a creative and unique eye when it comes to using this machine. We love using the Maker for fabric projects. One of the major selling points of the Maker is that it can slice through the material due to its included Rotary Blade. Grab some tips on how to cut fabric with the rotary blade here. The rotary blade is one of the 6 blades that work in the Cricut Maker. This blade has a special gliding and rolling action (together with a massive 4kg of force) which allows for super sharp and clean-edged fabric cuts. It comes with a fabric cutting mat, so you can cut all kinds of fabrics without using any backing. Simply choose an item to make from the massive sewing pattern library (including some from Simplicity and Riley Blake Designs) and ask the machine to cut out your pieces for you. 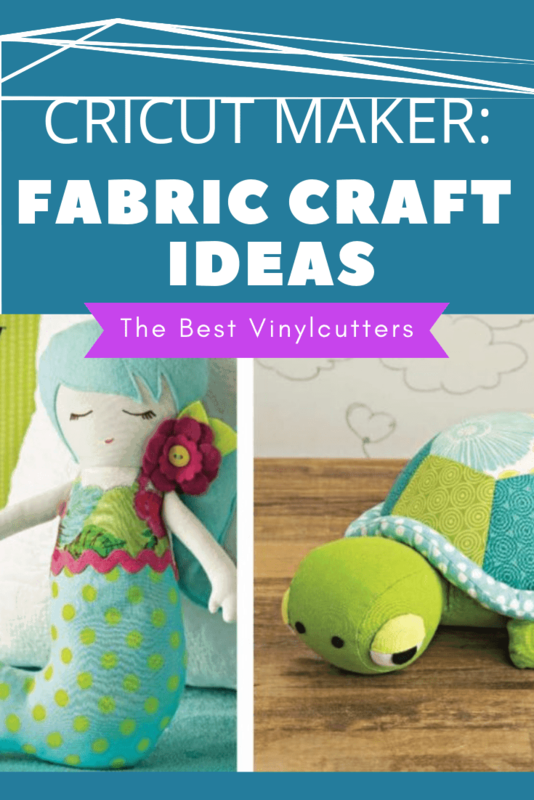 Below is a list of fabric cutting projects that you can master in no time. 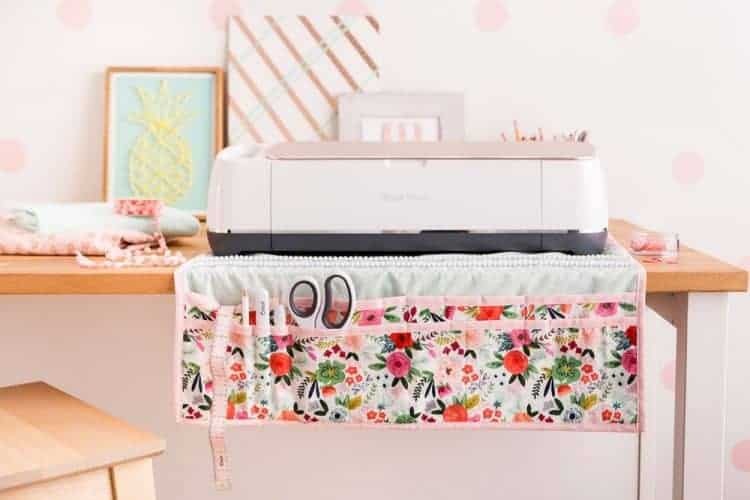 You can also read our detailed Cricut Maker review here or if you prefer you can compare the machine to other popular fabric cutting machines here. You might also like to consider purchasing a Cricut Maker Bundle which are incredible value deals. The Cricut team has been making advances in bettering its design quality for quilt making. Cricut has teamed with Riley Blake Designs to provide crafters with a wide variety of quilting patterns within the pattern library. You can accurately cut out the right patterns for sewing and make the perfect quilt with ease. You may want to make toys on your own as a DIY. 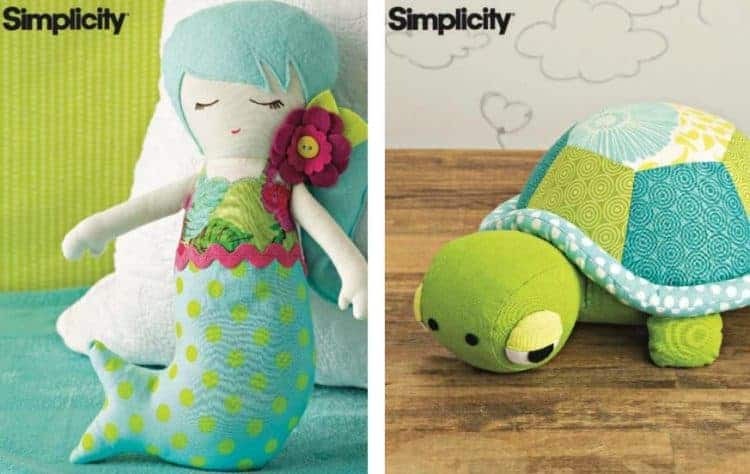 The Cricut maker easily allows you to cut patterns for soft felt dolls and soft toys. You can make a variety of different dolls for your kids. Aren’t these two above incredibly sweet!? If you love working with felt, you will love this post of our that has 10 of our favorite felt-crafts. The Cricut Maker can cut panels up to 12 X 24″. So whilst it will be tricky to make adults clothes with it, it is great for making baby clothing. Make and cut patterns so you to make baby t-shirts, onesies, shorts and more. Since you’re going to make dolls with the Cricut Maker, you can make them cute little doll outfits that will make them look more unique. Make multi-color doll clothing that will make your Cricut dolls stand out amongst your store-bought dolls. Using the Cricut Maker will make cutting fabric for making ornaments and Christmas stockings a breeze. This machine is perfect for designing one-of-a-kind fabric ornaments and/or stockings. The machine has a pattern library that you can use to blend different looks of Christmas or holiday decorations. Simply use the machine to cut your pattern out and then sew it together – easy peasy! Although you’ll need a bonded fabric blade in housing, you can also make a series of fabric appliques. These blades have to be purchased separately but, once you have one you can make many different intricately designed appliques with your applique fabrics. Important to note that unlike the with the rotary blade, the bonded fabric blade does require you to have bonded backing on your material. Quite simple to make and growing more popular are, fabric keyrings. There are easy designs in the pattern library. Dress your keys up with fashionable fabric keyrings. If you’re wanting coasters for your coffee tables or any other area of your home, office or elsewhere, make them with the Cricut Maker. You can cut different materials like leather, metallic, quilt sheets and more to make coasters. It’s likely you’re going to be doing a lot of sewing with the Cricut Maker. As you get all of your beautiful designs cut out, you’re going to need a pin cushion to hold all your pins. There are different pin cushion designs in the pattern library, but, you can get creative and make your own uniques ones too. Since the machine cuts 12 X 24 sized patterns, you can make lots of different pillows and cushions for your bed, chairs, couches, and nooks. You can make several great designs to spruce up your home. Don’t forget that you can cut out iron-on vinyl on your maker too, so why not take your cushion design to the next level. Why not whip up some special items for your kids. We love this DIY boys swimsuit. Here is a clever idea. Why not whip up an organizer to keep all of your sewing supplies on-hand whilst you work with the Cricut Maker. Why not create a totally unique backpack for your daughter or son? That way you can theme it according to their interests and passions and you can add some lovely personalization to it as well. Another really clever idea. Why not make a beautiful dust cover for your special Cricut Maker machine. The machine is pretty pricey so you might just as well look after it properly to ensure that it lasts for a long time yet to come. Select the cover design from your sewing library and sit back whilst the machine does its magic. Whilst there are plenty of free patterns in the Design Space library, you might also like to consider getting a Cricut Designs Space subscription. There are some incredible sewing patterns for coin purses, full-size purses and clutch bags available in the library. You can even take this a step further and make some wonderful leather purses as well. There are so many more ideas of what you can make with your machine, from dog coats, to aprons, to leather dog collars, to passport holders. Have a fun time working your way through all the beautiful sewing ideas. If you like, we would love to hear more about which project you will be attempting next. And for more inspiration on anything Cricut, click here to find our entire hub of Cricut resources.